Christmas is Coming – Really it is only 86 days away! It is slightly frightening to think that it is only 86 days until Christmas, but that also means that there are fewer than 80 days for me to finish making all my Christmas Cards. And let’s be clear here, by finish, I also mean start! The strange thing is that as a Professional Crafter, I have already made dozens of cards, just not for me. I start on Christmas in July, seriously, that is when I start thinking about Christmas projects, and then the big Christmas product order goes in at the start of August. So I have been in full on Christmas mode for more than three months, yet I still have to start on the 100+ cards Mr E and I will be sending out. So when was suggested that the Team Challenge for this fortnight should be ‘Christmas is Coming’ it was a bit of a stock take moment for me, because this is so true. We will blink and it will be upon us. I felt it was time to make a project using the current trend for Z Cards. This is a basic 5×7 base, which means that with the added strip, it uses pretty much a full sheet of A4 cardstock (well in this case a bit more as I needed a wider band so my stamping would fit). 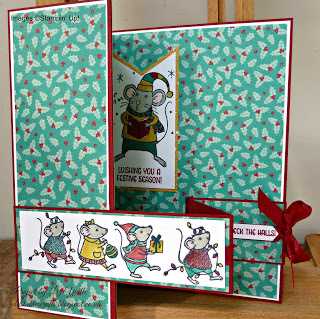 I am really quite pleased with the result as this is the first time I have used the Merry Mice Stamps. They were a late addition to my Christmas supplies as I was not sure I would like them, but having seen so many other projects using them, I fell in love with them, so here they are, they seemed just right for the ‘Christmas is Coming’ theme as they trot across the front of the card. They are perfect if you enjoy colouring in (which is another trend at the moment of course). For mass production you can do all the stamping and then colour in while watching TV. 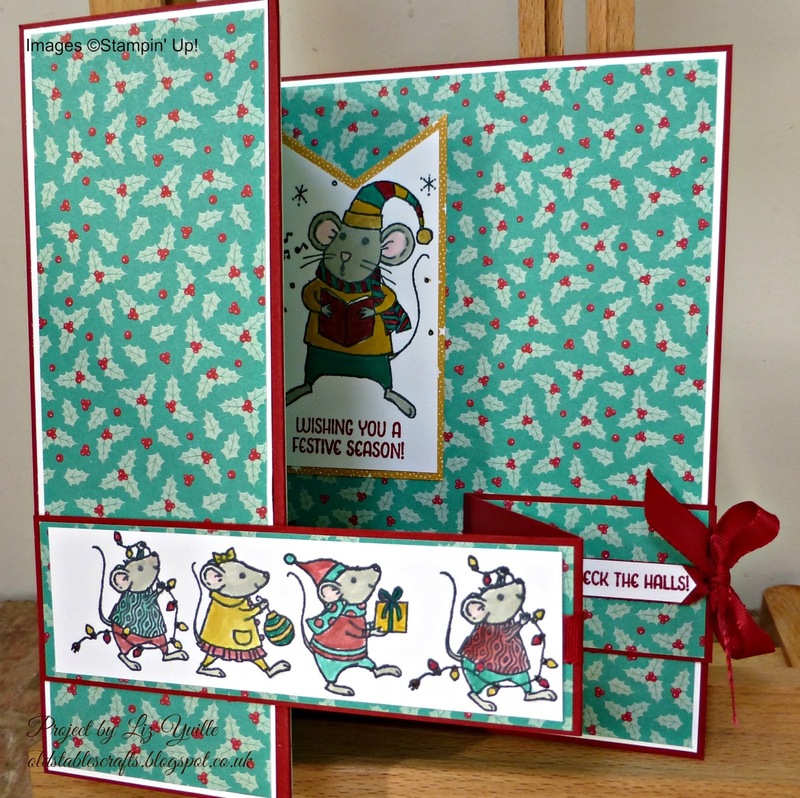 I hope you enjoy your build up to Christmas and that you manage to get all your card making done in a wonderfully stress free way. Remember, I am always here to help you, so please contact me by Clicking HERE, I have listed all the products I used below and they will link straight to my store. If you want to see what else is available, there is a link at the top of this page to my online store, which is open 24/7.